Captivating Former Randy Dean Model home on a stunning lake lot in desired Fiddler's Cove in a great location! Sitting just north of the Maize South School Complex, the kids will be just minutes away. The curb appeal will draw you in with professional landscaping, a grand entry way highlighted by custom brick and stone designs, and a gorgeous front door. This 5 BR 3 BA 3 Car Garage home is designed with an open floor plan featuring floor to ceiling windows and remarkable lake views. You will find exceptional details throughout including upgraded woodwork, beautiful hardwood floors, granite countertops and a versatile library/office adjacent to the main entry. The one of a kind coffered ceiling of Knotty Alder highlights the formal Dining Room. Your family will hang out in the Great Room with beautiful built-ins, gas fireplace and stunning lake views, open to the State of the Art kitchen outfitted with large island, granite countertops, eating bar, custom tile backsplash, 5-burner gas range, custom range hood, huge walk-in pantry and informal dining. All kitchen appliances stay. Due to the split Bedroom plan, the impeccable, spacious Master Suite is truly private offering bay windows with more lake views, distinctive tray ceiling & walk-in closet. Two vanities and sinks, a make-up counter, tile floor, large walk-in tile shower and a separate jetted tub complete the glamorous spa-like Master Bath. Two more large bedrooms, a lovely Hall Bath boasting granite countertops and tile flooring, main floor laundry with sink and convenient drop zone round out the main level. As you enter the finished walk-out, view-out basement, you will think you have entered an Italian Villa boasting several lounge areas, wet bar, custom built-ins, eating bar, wine closet, a hand painted âcountry-sideâ mural plus tile floors enhancing the dining area. An abundance of Custom built-ins and a beautiful gas Fireplace complete the entertainment area. Two additional huge bedrooms and the 3rd Full Bath featuring his and her sinks, tile backsplash & floors complete this level. More entertainment space awaits outside on the over-sized composite deck with patio below, both providing marvelous lake views. The backyard is wide-open and would be perfect for a potential pool. The wonderful Fiddler's Cove neighborhood offers a community salt water swimming pool, 2 waterfalls and a trout stream. Close to New Market Square, churches, an abundance of restaurants and the WSU Westside Campus. Don't miss out on this amazingly prestigious home in the perfect location!! 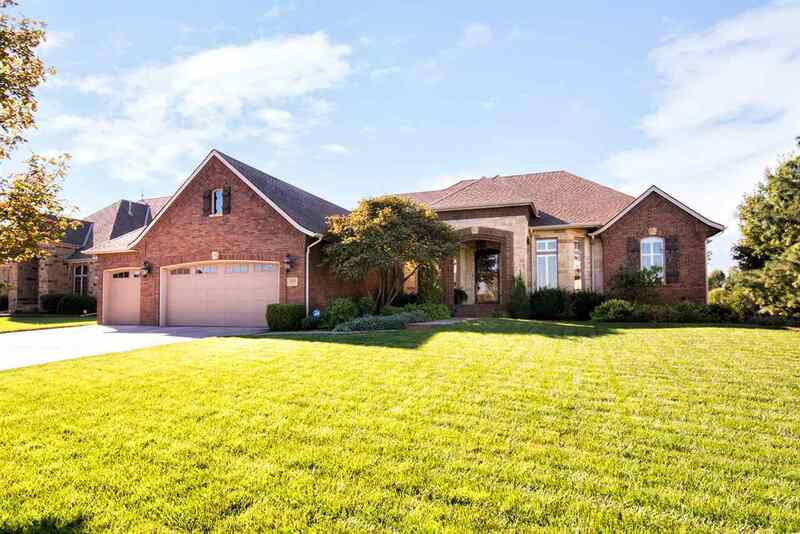 - Call to schedule your private showing today! !